Sleeps 8: 2 ensuite double bedrooms, 1 ensuite twin room, 1 bunk room. 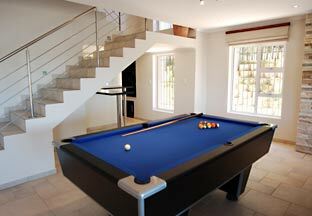 Heated rimflow pool, jacuzzi, built-in braai, pool table, double garage, ample parking, guest toilet to ground floor. 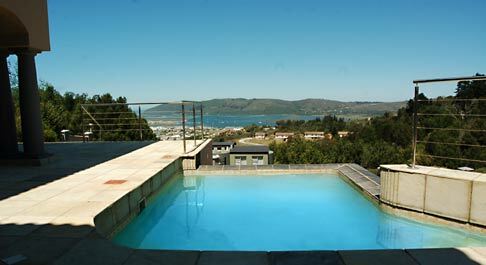 If youre looking to rent a spacious, modern holiday house in Knynsa that doesnt cost the earth, then Midnight Masquerade is the perfect choice. maintained and beautifully equipped, it boasts an impressive kitchen and dining area, comfortable lounge, four bedrooms, and a covered patio with sliding doors that runs the length of the property. All this, together with a host of home comforts - including a rim-flow pool, Jacuzzi, underfloor heating and home entertainment system - makes Midnight Masquerade the ultimate in affordable luxury. The master bedroom has a queen bed, balcony, ensuite bath/shower room, dressing area and TV (with DSTV). Bedroom 2 has a double bed, verandah, ensuite shower room and fitted wardrobes. Bedroom 3 is a twin room with verandah, ensuite shower room and fitted wardrobes. Bedroom 4 is located on the ground floor adjacent to the lounge and has bunk beds but no ensuite bathroom, so would be perfect for children. The lounge area offers excellent lagoon views and features comfortable couches, coffee table, TV (with DSTV), DVD player and sound system. Theres cosy coal-effect gas fire and underfloor heating for chilly evenings, a wine fridge to keep drinks cool on warm summer days  and a pool table to keep kids and grown-ups amused anytime of the year! The impressive open-plan kitchen/dining area offers every modern convenience: a breakfast bar, side-by-side fridge/freezer, hob, oven, microwave and a range of small appliances. The adjoining utility room has a washing machine, dishwasher and sink. 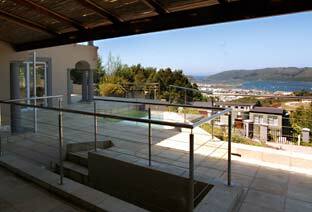 Sliding doors provide easy access to the patio and entertainment area from the lounge, kitchen and dining areas. 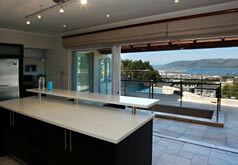 The propertys attractive covered verandah features a built-in braai, outdoor dining area, heated rim-flow pool, Jacuzzi and stunning views of Knysna town, lagoon and Heads. Accessed through electronic gates (with intercom connected to the lounge), the house has a paved driveway, double garage and additional parking for 2 further vehicles.